Over the years, the book industry has remained a massive, greatly influential global consumer market. 675 million print books were sold last year in the U.S. alone, and relatively new book formats such as e-books and audiobooks are already bringing in billions of U.S. dollars in revenue each year. With such a reliable global market, there is money to be made at many levels. Everyone from authors to publishers to booksellers is cashing in on the status of books as a staple of everyday life for people around the world, and companies like Amazon are vying to establish themselves in many different segments of the industry. The most important group within the book industry is, of course, the consumers. Books remain hugely popular among U.S. consumers, with 74 percent of adults consuming at least one book in the past year. A massive 98 percent of book consumers say that ‘pleasure’ is a main reason for their reading habits, which explains how they justify spending an average of 110 U.S. dollars each year on reading. If not reading for pleasure, millions of people also read through the course of their studies. 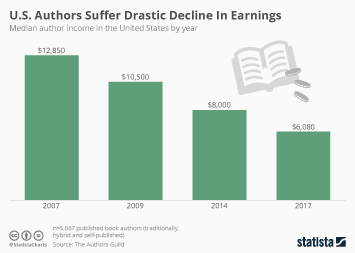 Book publishing revenues in the higher education market alone amounted to nearly 4 billion U.S. dollars in 2017, and yearly spending on course materials averaged around 484 U.S. dollars per student. From a retail standpoint the market has seen sweeping changes in recent years. Although U.S. book stores are still bringing in over 10 billion U.S. dollars per year, online retailers such as Amazon are beginning to restrict the ability of large physical retail chains to compete. Barnes & Noble, one of the largest booksellers in the United States has seen consistently declining revenue numbers for the better part of a decade. Online booksellers can offer prices and selection that physical retailers simply can’t match. Interestingly, at the same time that large national booksellers are struggling, independent bookstores are on the rise. Writers and authors, the creative engines behind the entire industry, introduce generation after generation of consumers to the power of reading, and the most successful among them are rewarded greatly for their efforts. James Patterson, one of the most productive and highest earning authors in the U.S. raked in a massive 86 million U.S. dollars last year. With bestsellers known to sell over a million copies, it’s easy to see how writers like J.K. Rowling have accumulated billions of dollars in earnings. For authors who haven’t yet made a name for themselves, self-publishing has become an increasingly popular method of release, with companies such as Amazon’s CreateSpace, Smashwords, and Lulu Press publishing thousands of books each year. While the formats and topics may change over the years, it’s hard to imagine a future in which books do not remain an integral aspect of the daily lives of people around the world. The industry as whole is one that has been quick to respond to technological change, without abandoning the styles and formats that have captured the minds and imaginations of readers for centuries. Annual print book unit sales in the U.S.